Hard to believe, but VeeamON 2017 is only a little more than five months away (May 16-18, 2017). If you plan to attend the leading conference on the area of Availability and Data Protection, then it is high time to register! This will save you and/or your company a lot of money. 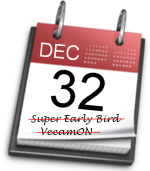 So if you want to catch the Super Early Bird price of 549 Dollar you have to register by December, 31 at the latest. 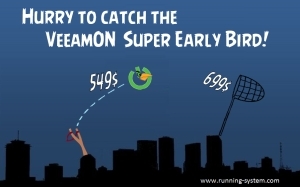 The next price category is the Early Bird ticket for 699 Dollar, only available between January 1 – January 31, 2017. After that date, the conference pass is available for the regular price of 849 Dollar. So you can save up to 300$ if you decide to attend and register within this year (2016). If you buy a regular priced VeeamON 2017 conference pass you can attend the VMCE course for only 1699 Dollar (instead of regular price $3000). In addition, you will receive a voucher for the certification exam. For End-Users the VMCE training will take place May 15-16, 2017.